1) Ride and Get Rewards! Create a TRAFFIX Rewards account or log into your existing account and record your trips. One (1) randomly selected new commuter and one (1) existing commuter who records a transit trip next week will be entered a raffle for a TRAFFIX Commuter Swag bag. Winners will be notified by email! 2) Participants who pledge to try transit during Try Transit Week are automatically entered for a chance to win a year of free transit service from a HRT, WATA and Suffolk Transit as well as a pair of round-trip tickets aboard Amtrak’s Northeast Regional train! Local prizes are listed below. Pledges will be accepted through September 21, 2018. This statewide event is sponsored by the Virginia Department of Rail and Public Transportation. Virginians are trying transit and loving it! You can try it this year during Virginia’s Try Transit Week, September 17-21. 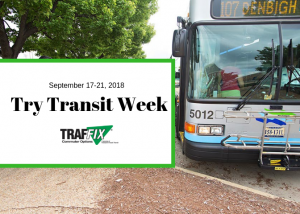 Join TRAFFIX and the Virginia Department of Rail and Public Transportation (DRPT) this week to celebrate.